Romney doubles down on his 47% comments. He really believes half the country, especially Indians and other minorities, are moochers who want government "gifts." Romney and his friends are being intentionally deceptive about the role of politics in people’s lives. We come together to do what we cannot do alone. Throughout American history, that has involved a widening realm of protection and insurance for poor, working- and middle-class Americans—until the GOP convinced a majority of people (particularly whites) that it was all going to minorities, and they began voting Republican. How can it be wrong to give the “gift” of guaranteed healthcare, if the American people so choose? And we did so choose by reelecting President Obama. Is it really some kind of skeezy gift to change immigration policy? Or reduce student loan debt? Or share the costs of contraception, as well as childbirth, which have traditionally fallen on women but which benefit everybody? By Ezra KleinDuring the campaign, Mitt Romney repeatedly promised seniors that he’d restore President Obama’s $716 billion in Medicare cuts. He promised them that, unlike Obama, he wouldn’t permit a single change to Medicare or Social Security for 10 years. He promised them, in other words, political immunity. While the rest of the country was trying to pay down the deficit and prioritize spending, they’d be safe. He also promised the rich that they’d see a lower overall tax rate, and while he did say he would try to pay for some of those tax cuts by closing loopholes and deductions, he also said he expected faster growth would pay for those cuts—which means he really was promising tax cuts to the rich at a time when he said deficit reduction should be a top priority. Oh, and let’s not forget his oft-stated intention to roll back the Dodd-Frank financial reforms and replace them with…something. Keep all that in mind when you hear Romney blaming his loss on “the gifts” that Obama reportedly handed out to “the African-American community, the Hispanic community and young people.” Romney was free with the gifts, too, and his promises to seniors and to the rich carried a far higher price tag than any policies Obama promised minorities or the young. But to Romney, and perhaps to the donors he was speaking to, those policies didn’t count as “gifts.” They were…something else. Good ideas, maybe. Or the fulfillment of past promises. Or perhaps it wasn’t the policies that were different, but the people they were being promised to. The last time Romney’s comments to his donors leaked, he was telling them about the 47 percent of Americans who don’t pay taxes, refuse to take responsibility for their lives, and will support Obama come hell or high water. These new comments are continuous with those: Romney really does appear to believe that there’s a significant portion of the electorate that’s basically comprised of moochers. That’s Romney’s political cosmology: The Democrats bribe the moochers with health care and green cards. The Republicans try to free the makers through tax cuts and deregulation. Politics isn’t a conflict between two reasonable perspectives on how to best encourage growth and high-living standards. It’s a kind of reverse-Marxist clash between those who produce and those who take, and the easiest way to tell one from the other is to see who they vote for. When Romney thinks he’s behind closed doors and he’s just telling other people like him how politics really works, the picture he paints is so ugly as to be bordering on dystopic. It’s not just about class, but about worth, and legitimacy. His voters are worth something to the economy—they’re producers—and they respond to legitimate appeals about how to best manage the country. The Democrats’ voters are drags on the economy—moochers—and they respond to crass pay-offs. Romney doesn’t voice these opinions in public. He knows better. But so did the voters. That’s what you see in the overwhelming rejection Romney suffered among African-Americans, Hispanics, Asians, and young voters. They sensed that Romney fundamentally didn’t respect them and their role in the economy, and they were right. 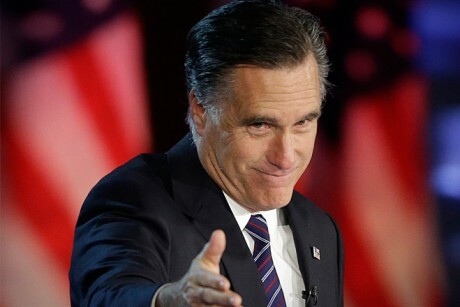 Mitt Romney stirred up controversy Wednesday by claiming President Obama won by effectively buying voters with policy. By James RaineyRomney couldn’t be expected to acknowledge that he offered up “gifts” of his own: extended tax breaks for the wealthiest Americans, a shredding of the regulations that would keep big investors from running amok, unfettered access for big energy companies to America’s wildlands. One of the most striking, and persistent, results of public opinion polls throughout 2012 was how the public felt about the two men running for the Oval Office. At the bottom, a majority of Americans felt President Obama understood people like them. They trusted putting the country in his hands for four more years, not simply because he gave them gifts, but because they thought he had their overall best interests at heart. They felt the investment whiz who made millions flipping companies didn’t understand the struggles of people like them. The voters assessed, not single issues or transactions that could be tabulated on a balance sheet, but an entire relationship they would have with whomever they put in the Oval Office. Romney’s best self—the one that gave tirelessly and deeply to his fellow parishioners in the Mormon church and who worked with opponents to make progress in Massachusetts—made an appearance now and then. But that Mitt Romney didn't seem, often enough, like the one who was running for president. So in what may be one of his final words on campaign 2012, the candidate explained how he understood the price of everything. And ended up looking like he knew the value of very little.Comment: To reiterate the obvious, here's why most people voted for Obama:The voters assessed, not single issues or transactions that could be tabulated on a balance sheet, but an entire relationship they would have with whomever they put in the Oval Office.As a typical Obama voter, I can confirm this. I don't personally benefit from immigration reform, student loans, free contraceptives, gay marriage, and so forth. Other than getting a small rebate from my insurance company, I don't benefit much from Obamacare. I voted for Obama because these things are good for the country, not for me personally. That Romney thinks this shows how stupid and out of touch with reality he was. His palpable disdain for half the country basically disqualified him from being president. Smart voters understood that, which is why they sent him packing. What's especially funny is to hear Jindal, Gingrich, and other Republicans denounce Romney for his comments. Where were they when he said the same things in the infamous 47% tape? At the time, most of them said Romney was basically right and merely phrased his remarks poorly. Now that they're stuck with the biggest loser in recent history, the hypocrites are changing their tune. That they criticize these "moocher" claims only when the election's over and nothing's at stake shows just how hypocritical they are. I'm guessing most of them still believe the Republicans' "moocher"-hating dogma. We know Gingrich, who labeled Obama the "food-stamp president," does. The pundits above are too polite to note the corollary to Romney's remarks, but I'm not. Many conservatives equate the "moochers" who want "gifts" with minorities. Romney's claims are basically racist. If he isn't a racist himself--a dubious claim--he played upon the racism embedded in the Republican Party. Even when he lost, he still told his conservative backers what they wanted to hear. White, middle- and upper-class Euro-Christians are the real Americans. Poor brown people are lazy, good-for-nothing bums. They're un-American because they won't work and sacrifice like white people to get ahead. Of course, this is what whites have been saying about blacks and Indians since the beginning. It's entrenched in America's founding mythology. Euro-Christians created America for the "chosen people"--i.e., hard-working, God-fearing folks like themselves. Everyone else is a leech and a parasite trying to sponge off the whites' self-proclaimed greatness. It's no wonder we heard so much about Obama's birth certificate and religion. These beliefs are consonant with the conservative worldview. And that worldview is fundamentally racist. For more on the subject, see GOP America = Strives vs. Parasites and Romney: 47% Are Moochers.